This annoying problem occurred twice when my HP Envy 17 laptop was running Windows 7 and more recently after having upgraded to Windows 8 several months ago. In all instances the problem occurred for seemingly no reason whatsoever, there had been no driver changes or upgrades to the system. When I was running Windows 7 I was unable to get the internal Broadcom bluetooth card working again (I researched and tried various driver removal and installation tutorials on the web and none of them worked). The only option was to completely reinstall Windows 7 from scratch with the latest drivers and this got everything working as it should. More recently having upgraded to Windows 8 (from a clean installation) everything bluetooth was working fine for several months. Then one evening whilst using my laptop my Microsoft Wireless Notebook Presenter Mouse 8000 just stopped working (the discovery light was blinking on the base). I tried to re-pair it with the laptop but nothing would appear in the list of devices when going to the 'Add a Bluetooth Device' option on the bluetooth icon in the task bar. After confirming that the laptop was unable to discover any bluetooth devices that I set to discoverable (such as my phone), then I used the following procedure to get everything working again. 15. 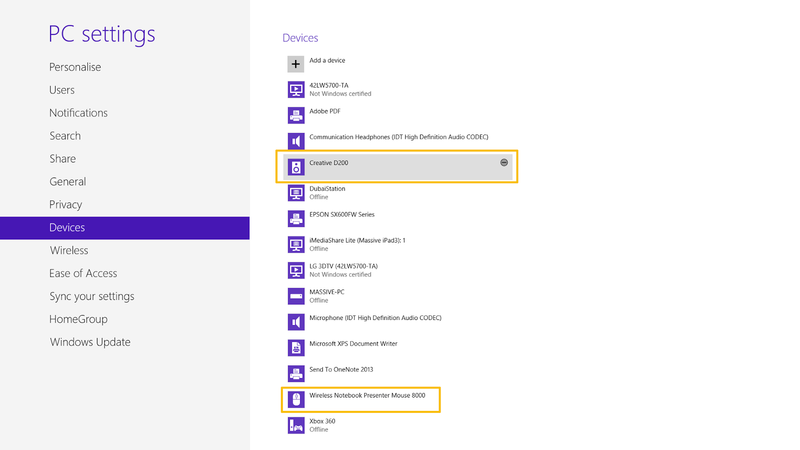 You should now be able to select and install all your bluetooth devices.